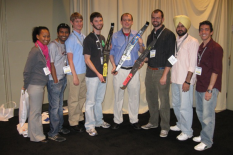 Left to right: Several graduate student members of the SAMPE Wing teams attended the SAMPE'09 conference: Nikesha Davis, Pathik Shah, Andrew Becnel, Ben Berry (holding 3rd place wing), Ben Woods (holding 1st place wing), Robbie Vocke (holding 2nd place wing), Harinder Singh, and Vince Posbic. This is an annual event for the University of Maryland?s SAMPE Student Chapter, for which aerospace Prof. Norman M. Wereley serves as the faculty advisor. The two project teams were from Prof. Wereley's ENAE-425/654 Mechanics of Composite Structures class. In total, $7000 in cash and prizes were awarded to winners, thanks to the generosity of dozens of contest sponsors. As part of the SAMPE ?09 conference and exhibition, this program creates great interest with industry leaders, exhibitors and students to observe new and creative composite building material projects. Each contest entry required a poster, featuring details about the materials and construction of each Lightweight Wing. Dr. Howard Kliger, president, HS Kliger & Associates, Somerset, NJ, and chair of the contest for the past 12 years, willingly takes on the coordination of this project. Kliger stated, ?Their innovative work coupled with the energy of these young engineers not only excites, but also gives me hope the next great aerospace and civil engineers might be right here in Baltimore. ?